This product was designed for high performance without losing the power at all engine RPM range and with well-balanced power curve. Using the Valve Spring designed for this specific engine and this newly designed and high lift camshaft can dramatically improve the performance. Furthermore, once this product is combined with the HKS STEP2 parts and GT800 Full Turbine Kit, the boost pressure can provide smooth and quick engine power increase and achieve 850ps or more. 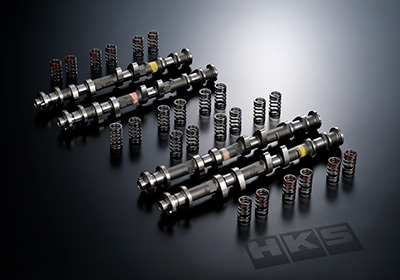 Exclusive chill camshaft material for HKS is used. POINT-2 Must be used with the special Valve Spring. Duration and valve lift were both designed larger than a stock. The Valve Spring included in this set must be used with this high lift camshaft. Lift volume was decided after the cylinder head measurement and flow test. Duration was decided to be well-balanced with a selected lift volume on the power curve at all range. The camshaft profile was optimized to clear points of the valve flow and/or cam lobe friction. The knock pin phase to position the cam pulley is the same as a stock so the valve timing can be same as a stock. The cam sensor trigger position is the same as a stock so the malfunction of the stock ECU won't happen. HKS controls from the production, inspection, package, and shipment for quality assurance.